Hello friends, so glad to see you here. I am back after two short trips to Mumbai, which is the reason I could not blog frequently. So, thank you for visiting me in spite of my long absence. I hope I was missed. A warm welcome to new friends who have joined me via Blogger, Bloglovin, Networked Blogs and Facebook. My latest trip to Mumbai was our annual visit for the Ganesha festival (Ganeshotsav). I love being in Mumbai during this festival as the whole city is vibrant, colourful, fragrant with flowers, noisy with music blaring out from loudspeakers, with huge crowds everywhere as everyone wants to catch a glimpse (darshan) of their favourite deity. And the Ganesha idols (!) in all possible sizes, heavily decorated with flowers, themed decorations and sometimes even real gold and silver!! Yes, that's right gold and silver. I have lots of photos and I will show them as soon as I am done processing them. You might enjoy this post I wrote long ago regarding the Ganesha festival. Now on to our favourite topic...crochet! 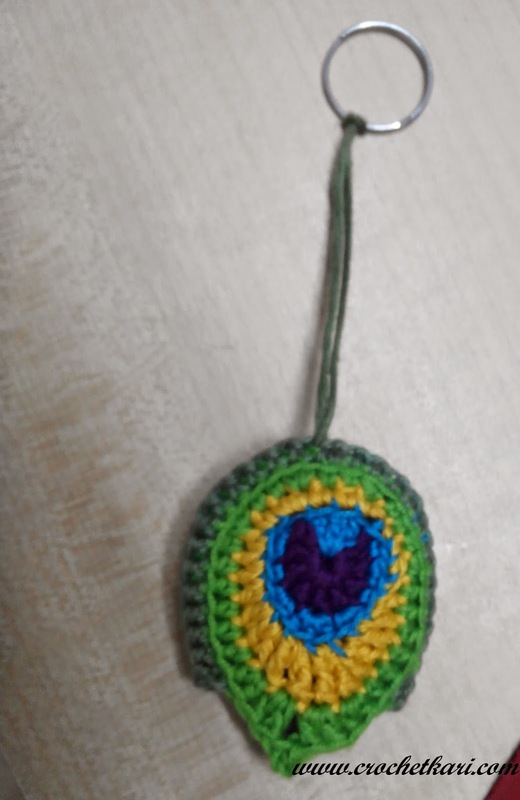 Recently I came across a pattern for a lovely peacock feather and decided to give it a try. Isn't that pretty!! Since my first attempt was fiddly I decided to make one more. Now I had two feathers and I thought they were too pretty to let them languish in my workbasket. So I was looking for a way to use them. While they would make beautiful appliques, I wanted to do something unique with them. Now, before I continue I must digress and tell you a small story. I love carrying pen drives with me, in my bag, as they are small, handy and a good way to carry my photos and patterns and even ebooks with me. Over the years I have "lost" quite a few of these as my son keeps "borrowing" them. Somehow the borrowed pen drives never came back to me. Once I even tried attaching a jingly jangly charm with lots of shells and bells to make it look girly enough to prevent the said "borrowing", but no use as he just removed the charm and made off with the pen drive!!! Ufff...these kids, always one step ahead of you. 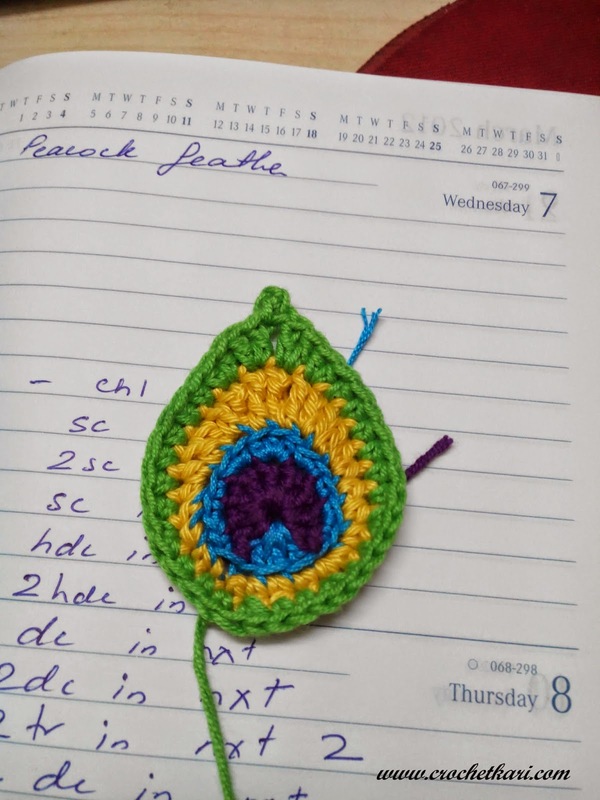 The two peacock feathers gave me an idea...that I could make a pen drive cozy by joining the two of them. So first I checked whether they will enclose my pen drive properly. So I joined the two feathers together leaving an opening just wide enough, then inserted the pen drive attached to a thread. I used a ring from an old keychain. This ring prevents the pen drive from popping out of the cozy and was also handy for pulling it back into the cozy. So what do you think? 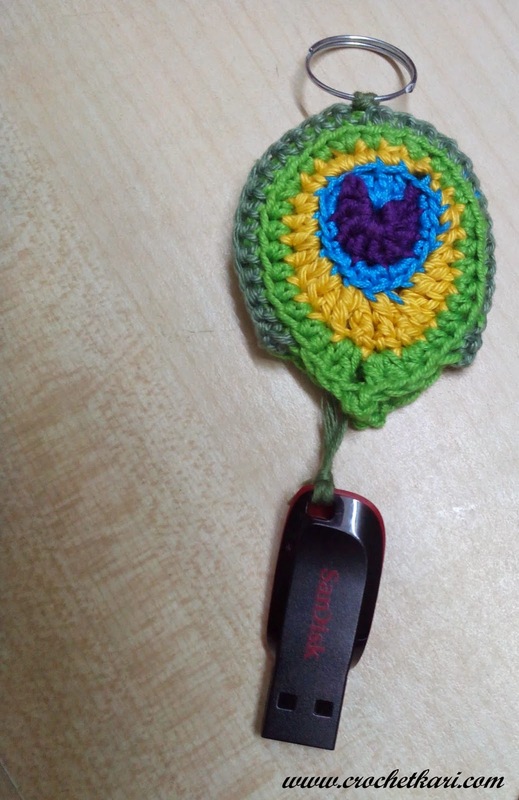 Do you like my crochet peacock pen drive cozy? Do let me know. Yes, yes, I know the question you are dying to ask... the pattern for the feather. So, my dears, here is the LINK at Living the Craft Life. I think these feathers would be perfect as appliques, jewellery, key chains, purse charms, baggage tags and more. 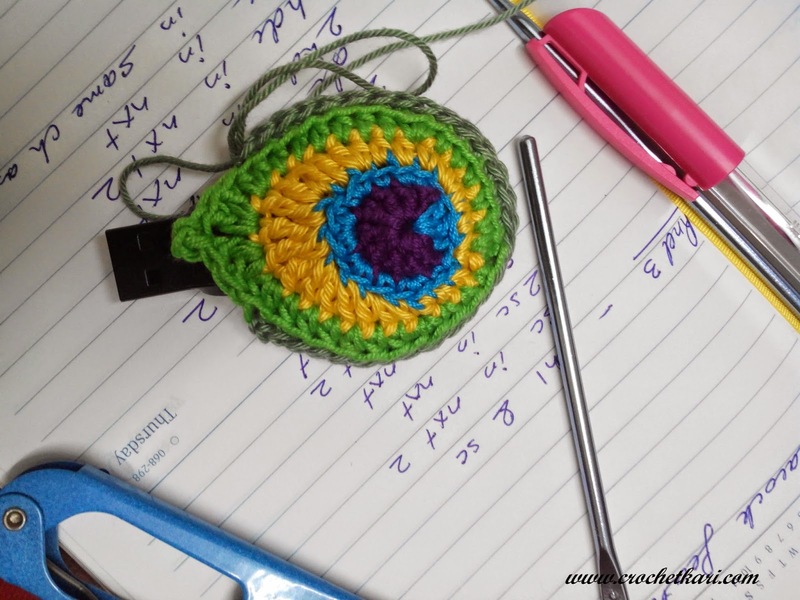 I also loved the article she wrote about the birth of a crochet pattern... do read it. I don't know whether this cozy will prevent further "borrowing" of my pen drive but I enjoyed making it and that is all that matters!! 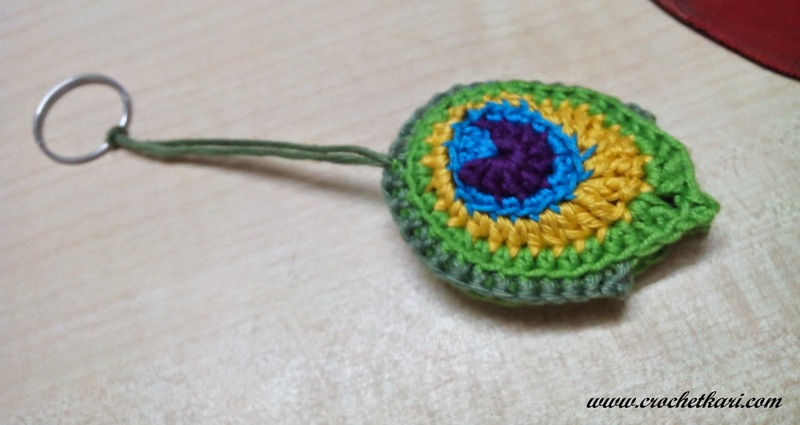 :) After all any excuse to crochet is a good excuse...isn't it?! Until then. Happy Crafting. And do write to me gorgeous ladies, I am really missing you. If you sent me any questions by email and I have not replied, please send me a reminder. 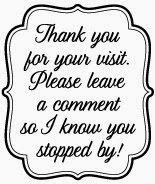 I am having some trouble commenting on other blogs, my comments are just not appearing, so while I have been visiting all my favourite blogs, I am sorry I could not leave a comment. Please bear with me. Maybe there is some error from my side. Dear Sangeetha, this is very pretty and so unique! I've never seen anything similar before, well done! I could imagine you could use it also for your keys! Or make a small purse for coins? Lots of possibilities! It is such a cuttee and lovely idea sangs !!! Looks real lovely !! Also the colors chosen are so beautiful !! Sangeetha, what an idea ! It really looks cute. I love your feather motif. I am using your inspiration for my new project!